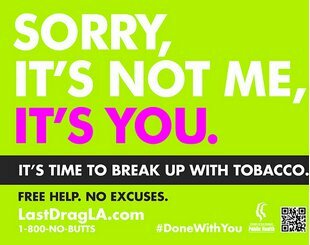 The Los Angeles County Department of Public Health launched an unprecedented new anti-smoking campaign aimed at the lesbian, gay, bisexual and transgender population, who smoke at more than twice the rate of the heterosexual population in California. Centered around popular nightlife venues and gyms, the innovative “Break Up With Tobacco” campaign combines traditional and experiential marketing, street team outreach and social media elements to facilitate peer-to-peer conversation within the LGBT community about the negative effects of cigarettes and tobacco use. The campaign features a group of young men called the Break Up Squad, who will spread the anti-smoking message on social media outlets and at nightclubs and gyms. The California Department of Public Health reports smoking rates for gay, lesbian and bisexual Californians is 27.4 percent, compared with 12.9 percent among heterosexuals in the state.